In Belarus, there are lots of interesting sights. One of the newest sight is Dudutki. 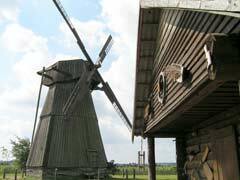 Many tourists, who visit Belarus and its capital Minsk, already know that the tour to Dudutki became a kind of “Must” to know about Belarus. For the Belarusian tourism Dudutki takes importance as a visit to the castle of Radzivilov at Nesvizh, Victory Square in Minsk or the Bialowieza Forest. Dudutki is a museum of Belarusian rural culture, which represented many national crafts - and even also about the people who fabricate this crafts. In the museum you can visit this IOPC and see how early forge horseshoes and armor. You can watch the work of the potter. You can taste the cheese, prepared expressly for the local creamery. And cheese that is well used as starters for another feast in Dudutki - Samorgon. On the territory of Dudutki is the only one in Belarus moonshine apparatus, which officially authorized to make this hard liquor. Throughout the rest of Belarus Samorgon is made only “informally” on a « If you want, you can» way. However, the administration allowed officially, of course, adds to visitors confidence in the safety of the product. If a tourist buys a full tour of the museum, it is the entire Adventure at the century-old mill, which offered one attraction - the rise to the top of the mill testing Samorgon at each of the four stairs on the road to the top. The Dudutki Ethnological Museum complex includes several buildings - this craft courtyard with a creamery, Pottery workshop, a mini-exhibition of folk life and forge. Here lies and garage, where you can see examples of antique cars, including a captured «Horh» from World War II. Well – those are not produced in Belarus – but used there. Over the craft courtyard is Animal Farm, where in addition to the usual cows, geese and chickens live wild boar and deer. Especially worth noting clearing the pond, around which the pace local and exotic pheasant. Here, apart from birds, another curious element of landscape is an old phone booth, which was typical of the urban landscape of Belarus even 40 years ago. It is in Dudutki and his temple. A wooden church in honor of John Prophet built near the entrance to the estate in 2008. It remains to add, you can get in Dudutki as excursion or independently. The village is located 40 kilometers from Minsk. You need to go to Slutsk highway pointer to the Museum of Dudutki, then turn and go straight.